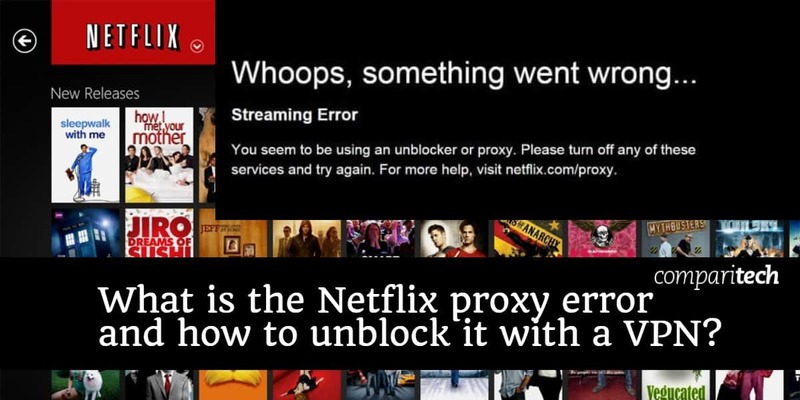 What is the Netflix Proxy Error and which VPN's still Bypass it in 2019? If you are frustrated by the Netflix proxy error you are not alone. We explain what it is, how to bypass it with a VPN and which VPNs currently work. In this article, we’ll discuss what the Netflix proxy error is, why it’s there, how it works, and how to bypass it. Why does Netflix ban VPNs and proxies? When Netflix went global a couple years back, it didn’t have all the licensing rights necessary to stream all of the same TV shows and movies to every country. Even before the worldwide rollout, users connected to VPNs and other types of proxies in order to access other countries’ Netflix libraries. The US Netflix library is particularly popular due to its larger and generally newer catalog of TV shows. A proxy acts as a middleman between your device and Netflix. Instead of communicating directly with Netflix, internet data is first routed through the proxy server. To Netflix and other websites and apps, it appears as though the user is connecting from the proxy server’s location instead of their own. If the user is in Canada and wants access to US Netflix, for example, they can connect to a proxy server in the USA. In simplest terms, VPNs work the same way but usually encrypt data in transit. Netflix started blocking connections from all proxies and VPNs in early 2016 in order to enforce its copyright obligations. Even users who connect to a proxy or VPN server in their own country get hit with the proxy error, despite the fact they aren’t unblocking content from another country. Netflix has done a commendable job in expanding its international libraries, but some countries still have content not available in others, so the demand for Netflix unblocking continues. The most reliable method to unblock Netflix from abroad is still a VPN, despite Netflix’s best efforts. Below are five of the best VPNs for Netflix to bypass the proxy error. ExpressVPN unblocks Netflix in several countries including the US, the UK, and Canada. You can connect up to three devices on Windows, MacOS, iOS, Android, Amazon Fire TV, Linux, and certain wifi routers, all of which work with Netflix. If you’re not sure which server to use, just use the provider’s 24/7 live chat support to get an answer in seconds. If your device doesn’t support VPNs, for example, if you’re using a game console or Apple TV, you can use the MediaStreamer smart DNS proxy included in every ExpressVPN subscription. BEST FOR NETFLIX:ExpressVPN is our top recommendation. It’s been reliably unblocking Netflix since the proxy error first appeared. NordVPN unblocks six countries’ Netflix catalogs, and any server you connect to will unblock Netflix. Most of them redirect to Netflix US, the most popular library. NordVPN allows up to six simultaneous connections on Windows, MacOS, iOS, Android, Linux, and Amazon Fire TV. EASY TO USE:NordVPN unblocks Netflix no matter which server you’re connected to, which makes it a breeze to get up and running. CyberGhost unblocks US Netflix and is a great budget option. You can easily browse through any of the unblock-able streaming services shown in the app, and there are a lot of them. Apps are available for Windows, MacOS, iOS, and Android. GREAT DESIGN:CyberGhost specifically lists Netflix servers in its apps, so you don’t have to guess at which locations work. PrivateVPN is a smaller provider, but it unblocks Netflix in 20+ countries. If you’re trying to access a show or subtitles only available in a specific country, try this one. Apps are available for Windows, MacOS, iOS, Android, and Amazon Fire TV. ONE SIZE FITS ALL:PrivateVPN unblocks Netflix in more countries than any other provider we’ve tested, so it’s great if you want to access international libraries. Ivacy can unblock US Netflix for a lower price than most of the competition. Users get 24/7 customer support and can install the app on Windows, MacOS, iOS, Android, and Amazon Fire. UP AND COMER:Ivacy reliably unblocks US Netflix from anywhere in the world on both mobile and desktop. Read our full Ivacy review. How does the Netflix proxy error work? Netflix doesn’t publicly disclose how the VPN ban and proxy error work, but through our extensive testing, we can surmise a few things. An IP address is a unique string of numbers and decimals assigned to every internet-connected device. Public IP addresses are visible on the web and correspond to specific countries. Whenever you connect to a VPN or proxy, your device’s public IP address is masked by that of the proxy server. Netflix blacklists most proxy and VPN server IP addresses. Rather than weeding out individual servers, we believe Netflix simply blocks entire ranges of non-residential IP addresses. Netflix knows most proxy servers are hosted in data centers, which use different ranges of IP addresses than residential networks. Netflix can also detect when some VPNs and proxies are being used through DNS. Short for Domain Name System, DNS works like a phone book for the internet that associates IP addresses with domain names. Whenever you go to the Netflix website, for instance, your web browser sends a DNS request to a DNS server. The DNS server looks up the IP address for Netflix and returns it to your device, which then fetches the video from the Netflix server. Netflix can determine which DNS server was used in this transaction. By default, your DNS server probably belongs to your local ISP and corresponds to a specific country or region. Many proxies and VPNs only route web traffic and not DNS traffic. If Netflix spots a mismatch between your DNS server location and your IP address location, it knows a proxy is in use and throws the error. Most good VPN providers route DNS traffic along with everything else through their servers, but the Netflix apps for iOS and Android compound the issue by overriding these DNS settings. The website version that you access in a web browser doesn’t do this, though, so unblocking Netflix in a browser is typically easier than on the mobile apps. Netflix cracked down hard on VPN and smart DNS proxy providers after its global rollout. Despite its efforts, a handful of VPN providers persevered and can still unblock Netflix today. Because US Netflix carries the most in-demand catalog, many VPN providers prioritize unblocking it. Fewer VPNs can unblock the less popular libraries. VPNs and smart DNS proxies remain the easiest and most popular means to access Netflix abroad. We’ll explain how each is able to bypass the proxy error. As mentioned above, a VPN encrypts a device’s internet traffic and routes it through a middleman server in a location of the user’s choosing. By connecting to a VPN in the US, you can access the internet as if you were physically located in the US. VPNs are frequently used to unblock censored and geo-blocked content. For the average Netflix user, a VPN comes in the form of a desktop or mobile app and usually requires a small monthly fee. Most VPNs that can reliably unblock Netflix don’t share how they do so. Again, however, we can surmise how they manage to do it. Because Netflix blacklists most data center IP addresses, VPN providers set up a handful of servers that use residential IP addresses. These IPs are off Netflix’s radar, and blocking them could result in some non-proxy users being unable to access videos. If Netflix happens to block a residential IP anyway, the VPN provider simply swaps it out with the next one in line. A few VPNs have also managed to force the Netflix app to use the VPN provider’s DNS servers instead of local ones. All of this ensures Netflix cannot determine whether the user is accessing videos through a VPN. A smart DNS proxy is a clever way to only use a proxy on an as-needed basis for certain websites, apps, and services. It is usually configured in the DNS settings of your device’s network settings menu. Like VPNs, DNS proxies often require a monthly subscription. We mentioned before that DNS works like a phone book for the internet. Smart DNS alters entries in the phone book for specific domains like “netflix.com.” Instead of Netflix’s IP address, a request for netflix.com on a smart DNS proxy sends your traffic to a proxy server in the US (or whatever location you want to unblock Netflix in). These proxy servers likely use residential IP addresses in lieu of commercial data center IP addresses so as to avoid Netflix’s firewall, similar to some VPNs. Unlike VPNs, however, your internet traffic is not necessarily encrypted, so you don’t get the same level of privacy or security. Most VPN providers that can unblock Netflix only operate a small handful of servers that can do so. This means users have to look up or ask customer service which server or location to connect to. To get around this, some providers combine a VPN with smart DNS to let users unblock Netflix regardless of which server they’re connected to. For example, when you connect to any NordVPN server through a VPN, you use NordVPN’s DNS servers. Those are smart DNS servers that, in most cases, will route requests to Netflix back to the US version, regardless of actual server location. This allows NordVPN users to access Netflix from any server location, although they might not get the localized version they’re expecting. In this case, even though you’re connected to a server in, say, Mexico, your connections to Netflix still run through US servers. Some VPN providers like ExpressVPN allow you to use smart DNS either with the VPN or as a standalone service. 1 Why does Netflix ban VPNs and proxies? 8 How does the Netflix proxy error work?